Credit card issuers have a legal requirement to send your monthly credit card statement at least 21 days before your minimum payment due date. Billing statements usually consist of one or two pages containing a good deal of information about what you've charged, how much you paid last month, what payment you need to make, and the date by which your payment must be received to avoid penalties. Your credit card statement will typically come in the mail, but if you've opted for online, or paperless billing statements), you'll either receive an email statement or need to log on to your credit card issuer's website to check your statement. When you review your statement, you'll find several different categories of information providing detail on a variety of account characteristics, described below. The account summary gives an overview of your credit card account status. Here you'll find your current balance, fees and interest charged since your last billing statement, the amount of credit you have available, and the date your billing cycle closed. Payments and transactions that posted to your account after the billing cycle closed won't be reflected on this credit card statement. However, if you log in to your online account, that balance will typically include your most recent activity. This is usually the first section on your credit card statement because it contains some of the most important information. The payment information section lists the payment you must make to avoid late payment penalties. This section includes your minimum payment and payment due date. If you pay less than the minimum or your payment is received after the due date, you could be charged a late fee, have your interest rate increased if you're 60 or more days late, and have the three major credit bureaus (TransUnion, Equifax, and Experian) notified of your late payment. The late payment warning disclosure explains specifically what will happen if the company receives your payment late. Credit card issuers are required to include a late payment warning on billing statements. 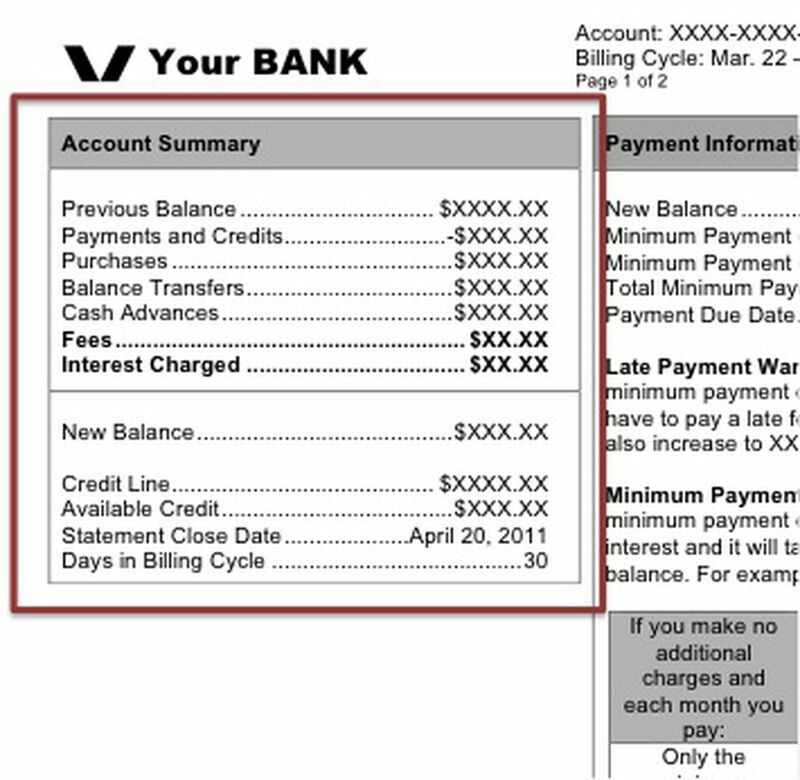 This section shows the consequences of sending your payment late, i.e., after 5 pm on the payment due date. You'll find out the amount of the late fee and the penalty APR that could be applied to your account if you don't make the minimum payment by the due date. Keep in mind that the late payment warning shows on every cardholder's billing statement regardless of the current payment status; it doesn't mean you've done anything wrong. If you had been late on a previous payment, the payment information section would include a past due amount. Late fees are now limited to the lesser of your minimum payment or $25, or a maximum of $35 if you've been late on a payment in the previous six months. The credit card issuer isn't allowed to raise your APR to the penalty rate unless you're 60 days delinquent on your payment. In other words, not until you've missed two payments. Once the penalty rate goes into effect, it will remain until you've made six consecutive timely payments. Then, it will be lowered, at least for your existing balance. Some credit card issuers leave the penalty rate in place for new purchases made after the rate was triggered. The late payment warning does not include the credit reporting consequences of late payments. After your payment is 30 days past due, the past-due account status may be reported to a credit bureau. Once you bring your account current again, the account status will show that you're caught up on payments, but your credit report will continue to show the late payment history for seven years. Credit card issuers are now required to post a minimum payment warning on your credit card statement. This disclosure tells you how long it will take to pay off your balance if you only make the minimum payment. You'll also find out the total amount you'll pay, including interest charges if you make the minimum payment. The box must also include the monthly payment needed to pay off your balance in 36 months (3 years) and the total amount you'll pay if you make that payment. If you decide to make the minimum payment after reading this section, you do so knowing that it's going to take the maximum amount of time and you'll end up paying the maximum amount of interest. The second box, showing the 3-year payoff payment, lets you know the amount of savings you'd receive by increasing your payment. You can also use a credit card repayment calculator to figure out the impact of various payment amounts or the payment amount needed to repay your account by a certain deadline. Your credit card billing statement must give you the contact information for a nonprofit credit counseling agency that you can contact if you're having trouble making your credit card payments. The sooner you get help the better. Keep in mind that credit counseling offers a long-term solution to your credit card repayment. If your financial problems are short-term, first call your credit card issuer to see if you can postpone your payment a few days and avoid a penalty. Any changes to your account, like an annual fee or increased interest rate, will appear on a special section on the front of your billing statement. The statement must also include the effective date of these changes. Details about the changes might also be mailed in a separately, so make sure you read all the inserts included with your statement and any extra correspondence from your card issuer. Your credit card statement will include a payment coupon that you can include with your credit card payment. Including the coupon helps the credit card issuer process your payment and apply the payment to the correct account. Detach the coupon and place it in the envelope with your credit card payment. If your mailing address has changed, make sure you have the creditor update its records. Otherwise, your future credit card statements will go to the incorrect address. Check the box indicating the address change and write your new address on the back of your credit card statement. You can also give your card issuer a call to let them know your new address or even change it online if your credit card issuer's website allows you to. If you're using the envelope that came with your credit card statement, make sure the credit card issuer's address shows through the window. Otherwise, your payment could go to the wrong address. If you use a different type of envelope without the window, copy the credit card issuer's payment address to the new envelope. You can also reference this address if you're adding the credit card issuer as a biller in your bank's online bill pay system. Note that creditors typically have a different address for processing correspondence, like a billing error dispute. That address will be printed somewhere else on the billing statement, perhaps on the back of a page. Pay close attention to the transactions section of your billing statement. Make sure all the transactions and amounts are accurate and report fraudulent or unauthorized charges to your creditor immediately. Only the transactions from your most recently completed billing cycle will be listed. Refer to previous billing statements for older transactions. Transactions made after the billing cycle end date will appear on your next billing statement. Interest is calculated separately for each type of balance you have on the credit card, including purchases, balance transfers, and cash advances. Promotional APRs and their expiration will be listed in this section. Your billing statement must include a running total of the interest and fees you've paid this year on your account. You can reduce the amount of interest you're paying by either negotiating a lower interest rate, which may be difficult to do or by paying your balance faster. Some fees you can't avoid, like an annual fee, but other fees, late fees and cash advance fees are easy to escape. If your credit card comes with a reward program, a summary of your rewards will appear on your credit card statement. This section will generally include your reward balance, rewards earned this period, and amount of rewards available for redemption.